Many websites/experts claim that the longer you hold your assets, the likelier your asset's return is closer to that predicted by the compound interest formula. However, some other experts claim that this is wrong based on the Modern Portfolio Theory and in fact the probability the asset growth will be at least that will decrease as you hold your assets longer. The chart below essentially shows how the probability distribution of asset growth changes over time with a portfolio of an expected return = 0.05 and risk = 0.2. In this simulation, the probability of you getting at least the expected amount as per compound interest is 46% on first year, 42% on fifth year, 38% on tenth year etc. In fact, more disturbingly, the mode of asset growth (i.e. the most likely scenario) will be 100% on first year, 98% on fifth year and 95% on tenth year. I.e. the most likely scenario is that you lose money (this changes when the return/risk changes. For example, under return=0.05 and risk=0.1, the most likely scenario is that you gain). a) Is this simulation a correct conclusion of Modern Portfolio Theory? The question "do they?" is a fair one, but the answer, "we can only observe the past, and that's what they did," may not be so satisfying to you. (for the S&P) to see that in an awful decade containing -37% and -22% that the full decade was "only" down 9% in total or just less than 1% per year compounded. I'm not predicting any particular returns forward, just noting this is how the math works. DCA performs well through such a decade, better than in a rising one. You are offered the opportunity to buy into a market selling below the long term trend. On rereading the linked article, I see where the author cites Zvi Bodie who clearly made a logical error. He concludes that since a 20 month S&P put costs triple what a 2.3 mo put costs, that there's more risk the market falls over the longer period, not less. American options can be sold or exercised at any time. If a 2 year option were cheaper than a 2 month option, no one would buy the shorter term. It's pretty simple that the Options Pricing Models take time into account and their value, put or call, increases along with the time till expiration. On a lighter note, when I take the S&P data for 1871-2012 (I know, no S&P back then, but it's Schiller's data) I get average 40 year returns of 44X, similar to the author's conclusion, $1K growing to $44K. But, the Standard deviation is 28. So the high end of +1 STDEV is $72K, not the author's $166K. Although, the low end 44-28=16 comes close to his $14K figure. $16K is a 7.18% long term return which today doesn't look bad. When the article was written, the author was looking at a 6% short term risk free rate. I researched quite a bit around this topic, and it seems that this is indeed false. 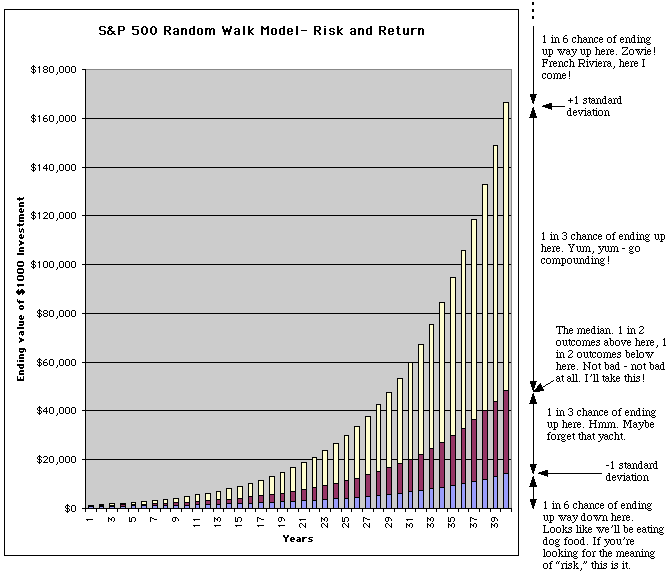 Long ter asset growth does not converge to the compound interest rate of expected return. While it is true that standard deviations of annualized return decrease over time, because the asset value itself changes over time, the standard deviations of the total return actually increases. Thus, it is wrong to say that you can take increased risk because you have a longer time horizon. Not the answer you're looking for? Browse other questions tagged asset-allocation portfolio risk dollar-cost-averaging risk-management or ask your own question. Is there a term for the risk of investing in an asset with a positive but inferior return? Is there data and proof that a diversified portfolio can generate higher returns than the S&P 500 Index?